Dog sledding is a popular activity for groups and events. 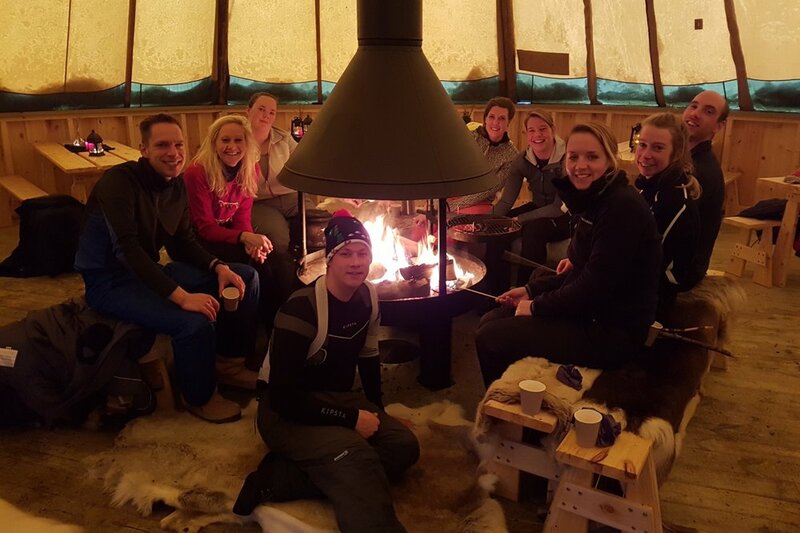 Not only is it great fun but also everyone can participate which makes it perfect for teambuilding. A colleague in a wheel chair or just a broken leg may still join to sit on. Company groups that fancy activities during seminars or company trips, groups of friends, family groups, tourist groups and other gatherings are all welcome to join us. just by the hotel Pellestova and Ilsetra! Groups are welcome all days on request as well as time of the day as you wish. Darkness is magic, we provide head lights. Depending on group sizes we may divide the group into three smaller groups. Each activity lasts for 30-40 minutes and 10-15min welcome and instructions are given to all of them before we start. That means that we can arrange for 50 persons within 2 hours. Price as below nok 750,- per person. Group 1 - Dog sledding 6km. We can do maximum 18 persons on one tour, that is 9 sleds with 2 guests on each. The two swap positions at half way stop. Our guides are both in front and in the back using leading sleds or snow mobiles. Group 3 - Bread twists on the fire and coffee/tea/toddy Making bread twists around the fire is always included on our tours and so on events. It is always a nice atmosphere in our cosy cabin. Including in a group arrangement you are welcome to enjoy dinner in our lavvu fitting up to 115 guests. Our popular creamy stew with moose is always a success and the group on the photo also had homemade brownie with caramel for dessert. Price dinner: nok 275,- and dessert nok 55,- per person. Smaller groups up to 14 persons may join a longer tour of 15 or 30 km. which is the maximum number of guests we can do on one tour. In case we arrange another activity with the same length of time, the number of guests could be 28 divided in two groups. Price 15km nok 1200,- per person. Dinner may be arranged after tour as above. For booking/more information: contact Ida@sjusjoenhuskytours.no, tel +47 94846270. 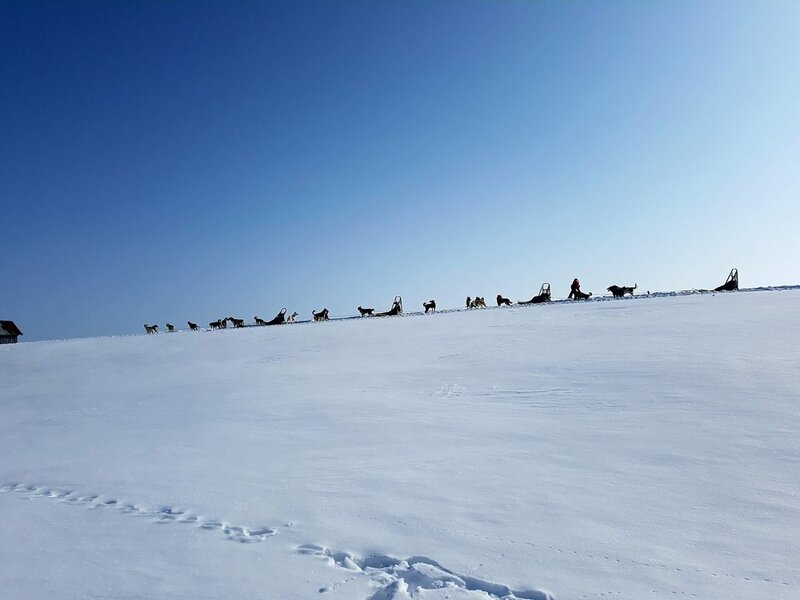 Just by the pleasant hotels Pellestova and Ilsetra we may arrange dog sledding for your guests. In case you stay at Scandic Hafjell, Hafjell Hotell or Hunderfossen Hotell & Resort distance is also shorter than Sjusjøen. Tour is 6km and we bring with us firepan for you to make our fantastic bread twists outside. For groups larger than 20 persons we may divide them in three smaller groups that try snow shoes with guide in addition to husky tour and making bread twists. Groups swap. This is an amazing combination for truly experience nature! A collaboration with Mesna Icelandic Horse Center at Mesnali. For larger groups we will split the group into two, where one half starts dog sledding and the other one with the horses. After the first round you meet up for a lovely lunch at Mesna´s barn. After the meal the groups will swop activities. The dog sledding tour will be by the lake Sør-Mesna and in some forest areas. Alternatively, join us at Sjusjøen in our mountain areas and provide transport to and from Mesna. For smaller groups, that is a way of joining this amazing combination. For prices and booking contact us at ida@sjusjoenhuskytours.no, tel +47 94846270.